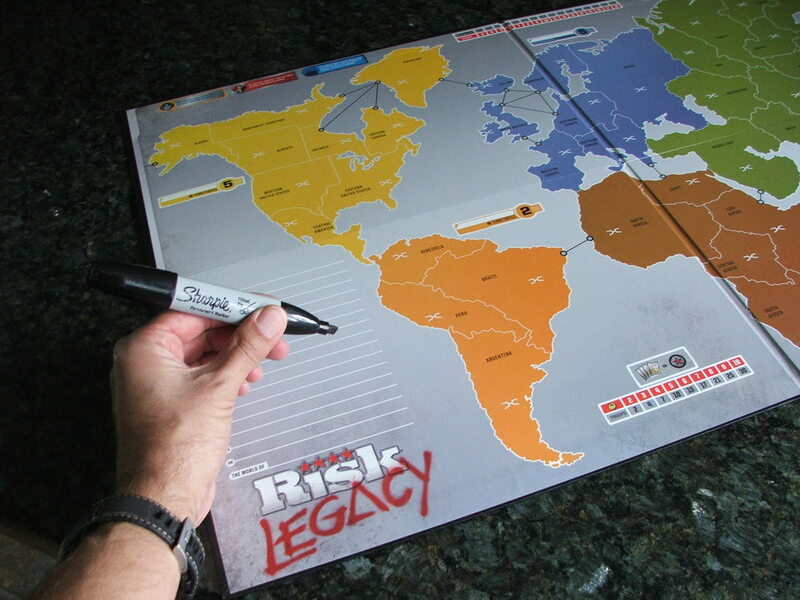 Risk: Legacy is coming out this week, and it puts a whole new spin on the Risk series, as well as a spin on modern day board gaming. How? Well first I should warn my fellow gamers because the next sentence is going to hurt. Over the course of playing the game, you will write on the board, add stickers to it, and destroy some of the cards. WHAT!?! If you're still here, let me tell you why. Now I haven't played it myself, but ever since I got an ad from my local game store with the following description.. I've been obsessed. How will you shape your world? 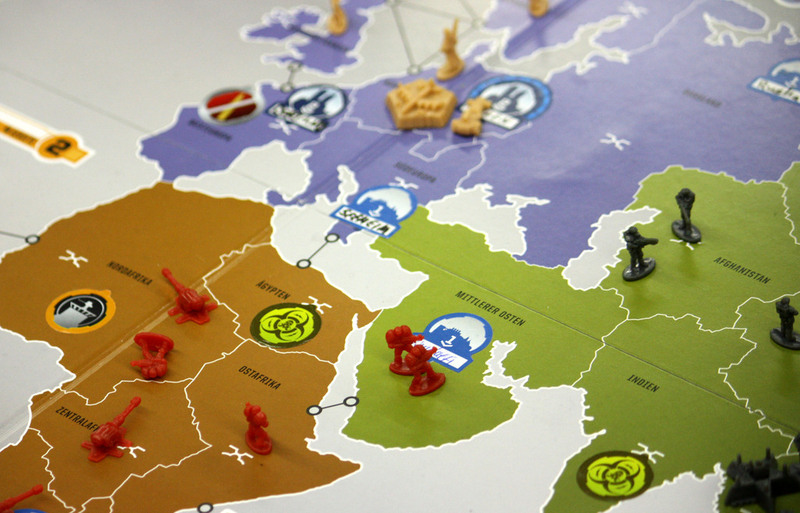 In Risk Legacy, every game you play will change every future game. A decision you make in Game 1 could come back to haunt you in Game 10. 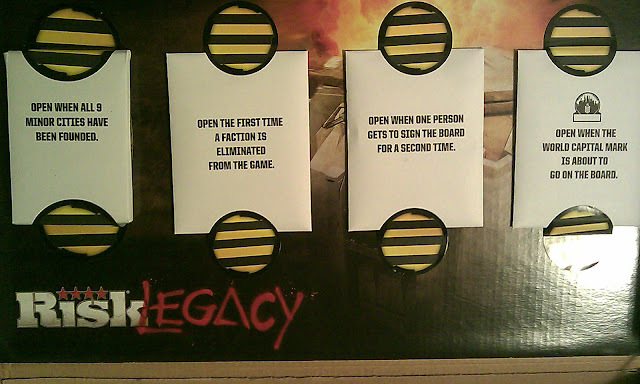 The risks you take in Risk Legacy are not like those in any other board game. You and the other players will shape how your world evolves: its history, its cities, even its factions and how they fight. Cards and stickers will come into play. Cards will go out of play forever. You don't forget past betrayals – and neither does the game. It is such a cool concept and from what I understand, that description barely scratches the surface. Click through the jump for more photos and excerpts from reviews of those lucky enough to already have the game (a/k/a jerks). So basically, it's a huge Risk battle game, where you mold the world (playing board, cards, character, etc) over the course of 15 games. After the 15th game you have a unique version of Risk, formed by the very games that you have been invested in. It's a wonderful concept; an RPG-ish (evolving gameplay) and somewhat video game-ish (the rewards are presented like Xbox achievements) high quality board game with mass-market appeal. It will be interesting to see how this goes over, but from the early reviews, everyone is very, very positive. Here are a few tidbits. I have played the game eight times now, and can confidently say that Risk Legacy is the most exciting game release since the turn of the century. It changes everything about the way games work and is more fun than I can remember a game being in more than a decade. 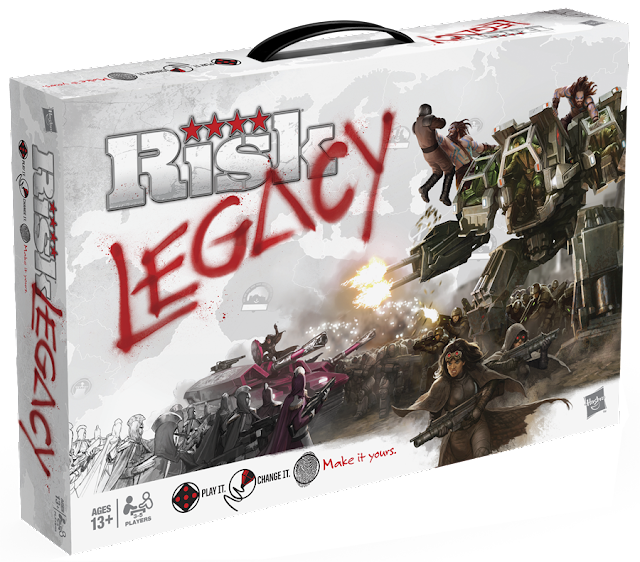 If I did rate games, it is with no hesitation whatsoever that I would rate Risk Legacy as the number one game I have owned since I started playing games. There's also another aspect to changing the game that people have tended to overlook, and it's from a philosophical perspective. A decision that is easily mitigated or can be reversed is not a powerful decision. It's a throw away. It has no real meaning, and there's no lasting repercussions. In this game, the decisions are as real as they get, and more emphasis and weight is duly applied to them. There's more angst, more tension, and more power wielded by the choices because the decisions are both game-changing and permanent. That's the single most novel thing in this game; it forces you to take all decisions seriously, and think about the long-term consequences of the things you do, the rewards you take, and the powers you wield because they are irrevocable. It's a brilliant way to force players to invest themselves into the universe's setting and the inhabitants therein. But let's talk a minute about the hows and whys of changing the board. First, when you win the game, you get to name a continent, add a major city that only you can start at during future games, create helpful or hindering terrain for future games, or make some territories more or less valuable. The game itself is a work in progress, and everything ties in seamlessly. Each faction is a persistent character in your world. Before the first game is played you must permanently add a starting power to each faction. You and your fellow players can collectively decide how each faction will play, a decision that will color a faction’s strategy forever. Faction cards clearly show space for at least four powers, and as packs are opened more powers will become available. In this way, no two sets of factions will be the same. 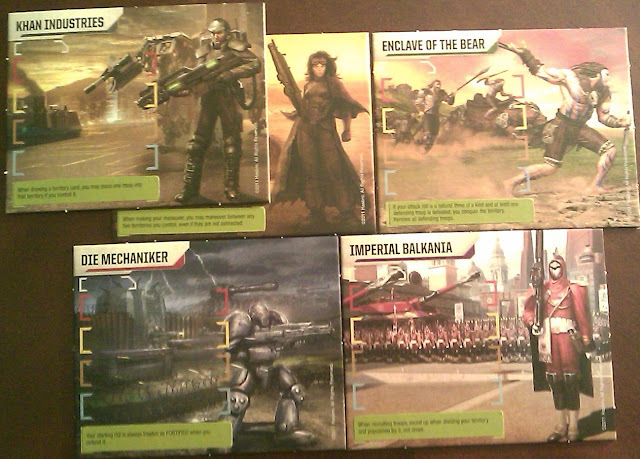 Your copy of Risk: Legacy will have a very different Die Mechaniker than mine. I'm really hoping to score a copy on Black Friday and start my little campaign immediately. I just need to decide who to play with, or more specifically, to decide who will be the people to shape my game. So what do you think? After reading the reviews, could you take a Sharpie to your brand new game board? Movember Day 24: Top 5 Muppet Moustaches! Movember Day 22: Thomson & Thompson. Banners Reveal new Avengers Title. Movember Day 21: Sam Elliott. Under the Man-croscope: Power Lords!